The emerald cut diamond ring, which has quite a long and interesting history, offers less sparkle than its round and oval shaped counterparts but is witnessing a modern day revival thanks to its unmatched clarity, vintage feel and exceptionally sophisticated look. It has become the preferred choice for engagement rings among the fashion elite and celebrities, such as Jennifer Aniston, Paris Hilton, Melania Trump, Kim Kardashian, Beyoncé, Amal Alamuddin and Angelina Jolie, who want their ring to reflect understated elegance. What Makes the Emerald Cut Diamond Ring So Special? The cut of a diamond is one of its most defining characteristics as it determines the stone’s brilliance, sparkle and durability. Though not the same as cut, the shape of a diamond plays a large role in what standards are applied to rate the cut of a diamond. An emerald cut is rectangular in shape with tapered corners and stepped facets (the stone’s smooth surface area), which look like the steps of a staircase when viewed directly from the top, resulting in a facet style known as step cut or table cut. Its large, open table and step cuts create a stunning hall-of-mirrors effect to lend an emerald cut diamond ring a mesmerizing look. While offering less fire than other cuts, the step cut style of faceting produces dramatic flashes of light and gives an emerald cut diamond ring an understated, yet stylish, sophisticated look. Apart from its elegant and vintage look, an emerald cut diamond ring also offers some unique advantages over other shapes. For instance, the center stone set in an emerald cut diamond ring appears larger due to its greater surface area, and its elongated shape makes the wearer’s fingers appear longer and more slender. The emerald cut was originally developed for precious emerald gemstones, as the emerald often comes with inclusions or internal flaws, which increases their risk of chipping during the cutting process and this style both allows less pressure on the stone during cutting while also enhancing natural color in the stone. But the story of how the emerald cut came to be used for diamonds is an interesting one. Being the hardest substance on earth, it was almost impossible to polish and cut diamonds in ancient times due to lack of knowledge and the right tools. In the 13th century, gem cutters discovered that they could polish and cut diamonds using their own dust, leading to different styles of diamond cuts being developed over the years. 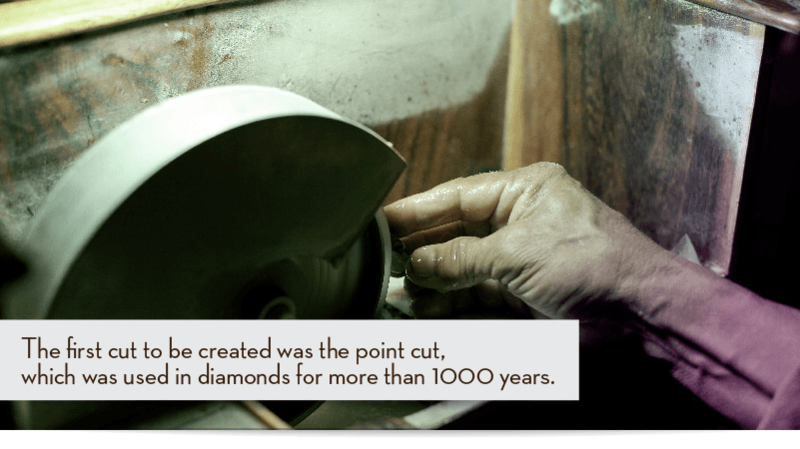 The first cut to be created was the point cut, which was used in diamonds for more than 1000 years. In the early 1400’s, gem cutters learned they could slice off a stone’s rounded surface to make it flat like a table, leading to the creation of a new cut called the table cut, which became extremely popular and replaced the point cut. From the 16th century until the 19th century, gem cutters developed different cuts such as the rose cut, transition cut, old mine/cushion cut, old European and English round cuts and the Asscher cut. In the early 20th century, diamond engagement rings started gaining popularity and became a tradition in the 1930’s during the Art Deco era. This forced gem cutters to experiment with different cuts that could increase the diamond’s brilliance, and several modifications were made to the earlier table cut by adding a number of narrow facets to the edge of the table. These new cuts came to be known as step or trap cut and allowed the diamond to be cut in different polygonal shapes, such as square and rectangular. 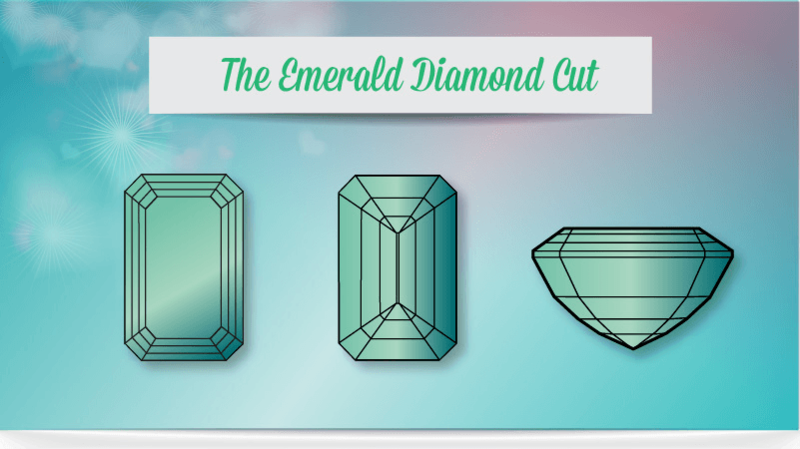 Gem cutters finally realized that the emerald cut, which had been initially developed specifically for emerald gemstones, could maximize a diamond’s brilliance and began applying the style to diamonds. But the emerald cut did not follow any set pattern or design and gem cutters began cutting the same shape in different names. It was only around 1940 that the emerald cut was standardized with a total of 58 facets (25 each on the pavilion and crown, and eight on the girdle, and three rows each of top and bottom steps), and replaced the table cut and step cut in engagement rings. 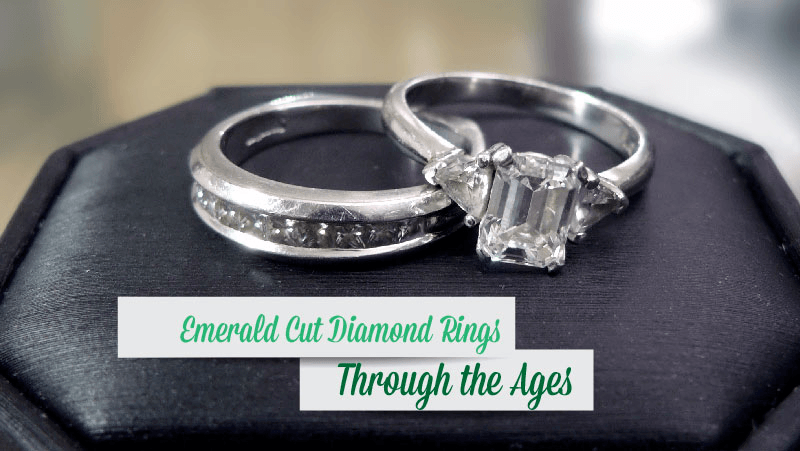 Even after its standardization, the emerald cut has continued to evolve with modern designers further advancing its design by using the latest technology. For instance, the Prince Cut, which was patented in 2000, is an advanced design of the emerald cut and features additional facets, elongated sides and cropped corners. Diamonds have always been associated with passion, and all forms of diamond jewelry, including engagement rings, are believed to improve romantic relationships. 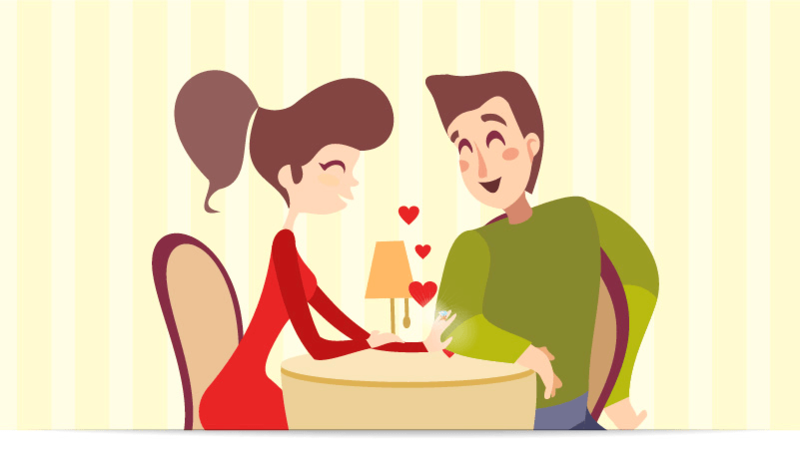 An engagement ring, particularly one with a diamond, symbolizes unending love and the promise of a future together. 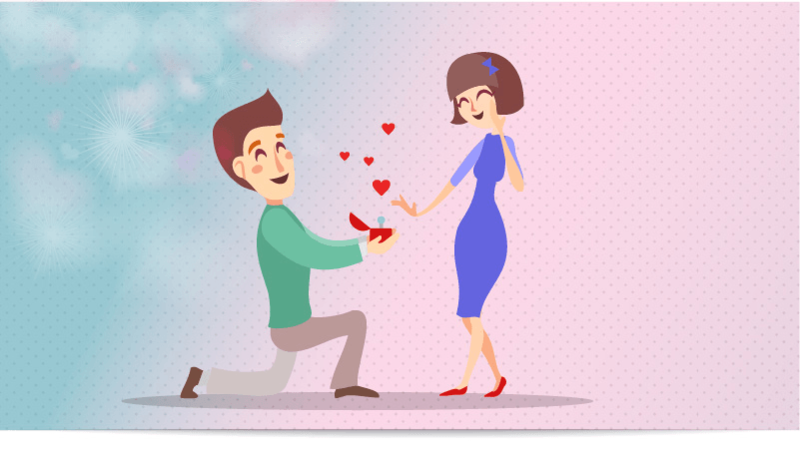 The Archduke Maximilian of Austria is said to be the first to gift a diamond engagement ring to Mary of Burgundy in 1477. Since then, engagement rings with large diamonds, particularly emerald cut ones, have been worn by some of the world’s richest and most famous. 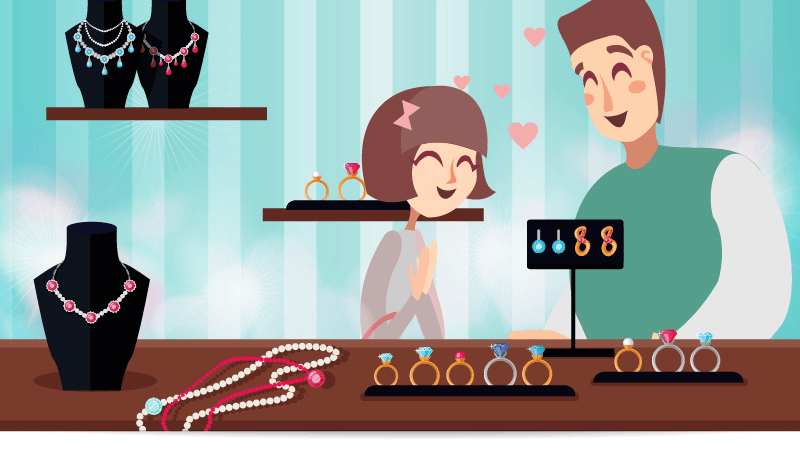 In 2012, Americans spent $7 billion on diamond engagement rings. Round brilliant cut diamonds still remain the popular choice for engagement rings, thanks to their sparkle and brilliance and only 3% of the diamonds in the world are emerald cut. Still, its gorgeous, distinct and unmatched vintage look has made the emerald cut diamond ring a hot favorite for women across the world. The less fiery, but exceptionally sophisticated look has made the emerald cut diamond ring the first choice for celebrities and the fashion elite who are less interested in a cut that exhibits brilliance and fire, but are more keen on making a statement about their creativity and individuality. Lady Camilla Bowles is known to have worn one of the most famous emerald cut diamond rings gifted to her by her would-be husband, Prince Charles Windsor of Great Britain. The Thirties Art Deco platinum-set, emerald cut diamond ring belonged to Charles’s grandmother, Queen Elizabeth the Queen Mother, and is currently valued at about $250,000. American celebrities, such as Jennifer Anniston, Melania Trump, Paris Hilton, Kim Kardashian, Beyoncé, and Angelina Jolie, have also exhibited a taste for emerald cut diamond rings. Back in 2008, popular rapper Jay Z popped the question to Beyoncé with a stunning 18-carat emerald cut diamond ring worth $5 million designed by Lorraine Schwartz, a coveted jeweler to the stars. Stylish celeb Kim Kardashian’s three-stone engagement ring gifted by Kris Humphries in 2011 weighed a total of 20.5 carats and included a 16.5-carat emerald cut diamond. Hollywood actor Brad Pitt proposed to Angelina Jolie in 2012 with a dazzling emerald cut diamond engagement ring worth $250,000 designed by jeweler Robert Procop. The engagement ring has a multifaceted design with the center stone mounted in a band of multiple smaller emerald cut diamonds for a unique look. And more recently, Hollywood heartthrob George Clooney proposed to Amal Alamuddin in 2014 with an ethically mined emerald cut diamond engagement ring weighing more than 7 carats. The emerald diamond cut still remains the preferred choice for celebrity engagement rings and this dazzling Art Deco sparkler will probably continue to dominate other shapes in the realm of vintage style with a contemporary feel that no other shape can hope to match. For couples hoping to jump on the latest wedding ring trends, emerald cut wedding sets are the way to go!